According to the latest data from market research firm Gartner, Apple shipped 5.6 million Macs worldwide during the three-month period ending in August, good for a 7.6 percent marketshare. The performance placed the Cupertino, Calif.-based company in fourth place among top PC vendors. Lenovo again led the pack with just under 15 million units shipped for a 20.3 percent share of the market, but that number was down 4 points from the same time last year. 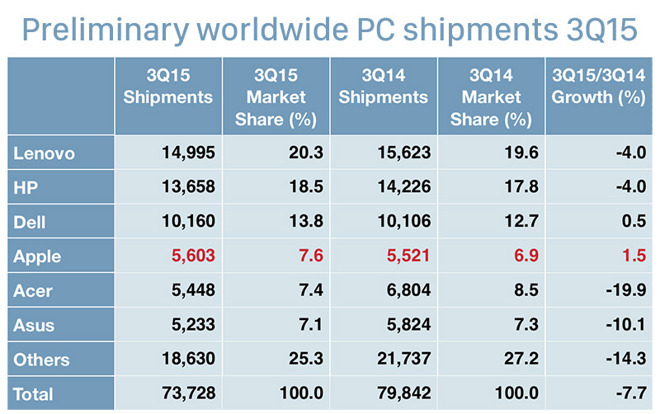 Also dropping 4 percent was HP, which took 18.5 percent of the market on sales of 13.7 million units. Aside from Apple, third-place Dell was the only other top-six firm to end the quarter with positive growth, gaining a 0.5 percent share on 10.2 million shipments. Acer Group and Asus rounded out the list with a respective 5.5 million and 5.2 million unit sales for 7.4 percent and 7.1 percent of the market. Compared to last year, Acer and Asus suffered negative growth of 19.9 percent and 10.1 percent, respectively. 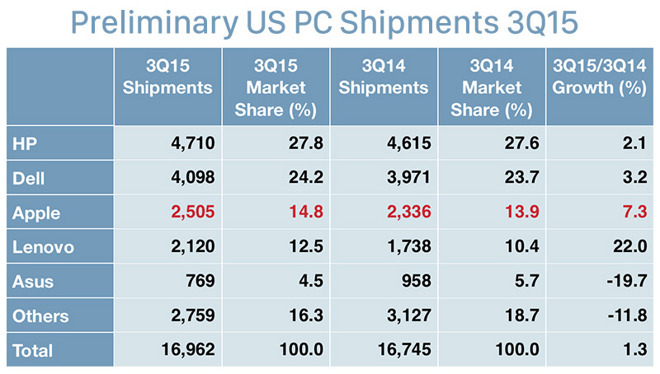 The PC market drooped 7.7 percent year over year as shipments hit 73.7 million units. Apple saw even higher rates of growth in the U.S. as Mac took 14.8 percent of the PC market on 2.5 million shipments, good for third place. Year-over-year gains came out to 7.3 percent, second only to Lenovo's massive 22 percent jump in marketshare. HP was top dog for the quarter with 4.7 million shipments good for 27.8 percent of the market, a 2.1 percent year-over-year increase. Dell was No. 2 with 4.1 million unit sales and 24.2 percent of the market, a rise of 3.2 percent. Apple and Lenovo followed in third and fourth place, while Asus' 769,000 unit shipments translated to a 4.5 percent marketshare. Apple's position was likely bolstered by strong sales of new equipment introduced earlier this year, including the 12-inch MacBook and refreshed MacBook Pro lineup. According to the latest rumors, Apple could launch a 21.5-inch iMac with 4K Retina display next week.